If you click on the photo it gets bigger so you can read the text. 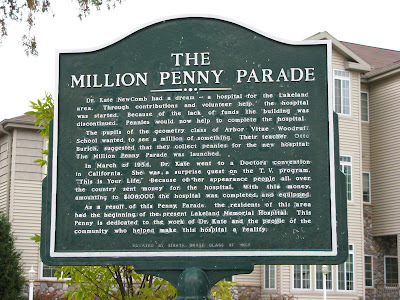 The gist of it is that Dr. Kate Newcomb wanted to build a hospital in little Woodruff, Wisconsin, and urged the local schoolchildren to save their pennies to help make it happen. Dr. Kate’s efforts ignited a penny drive that went wild. More than 1.5 million pennies were collected once the media got hold of the story. Children and grown-ups alike sent in pennies from across the country and Dr. Kate got her hospital. This is the city’s memorial to her–there’s also a museum but I didn’t go to that. 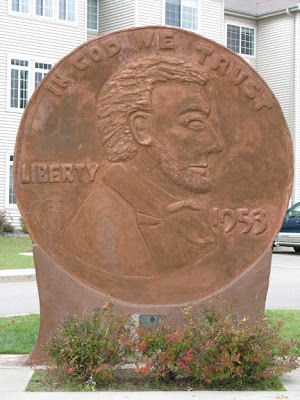 Just a quick stop on a road trip to check out the World’s Largest Penny that now stands in Dr. Kate’s honor.